According to Warner Spain, Mike will be in Spain on May 22, 23 and 24 to launch Tubular Bells 2003. Updated May 12: there will be a press conference on May 22 at 12:00 at Palacee de los Duqes de Pastrana (Palacio de la Once). 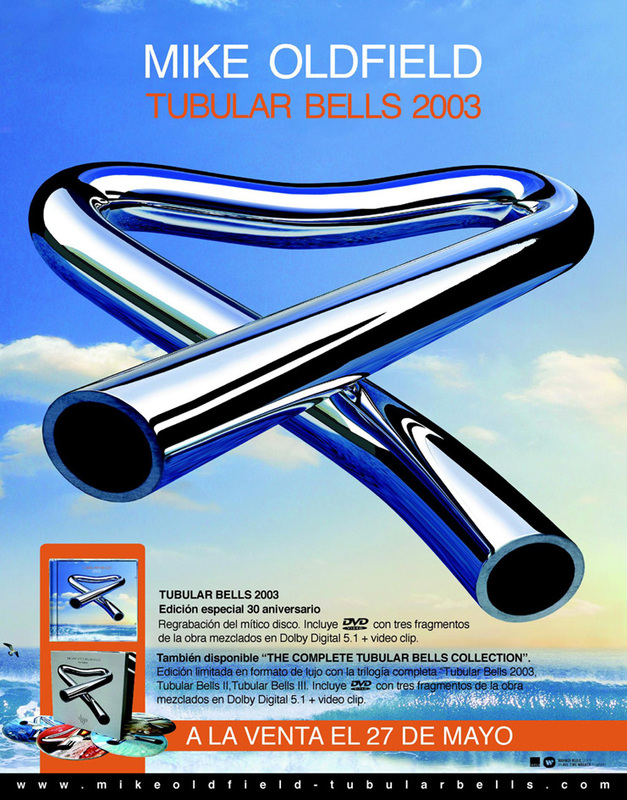 Journalists will be able to listen to the 5.1 mix of Tubular Bells 2003 from 11:00. Spanish ad (326K JPEG) annoucing the release for May 27. Why in Spain?? Why not in G. Britain? That's more obvious, no? Read everything I write at own risk. of any kind, caused by reading my posts. Mike´s record contract is with Warner Spain,not UK. That´s the reason for that. Though I'm going to visit there in the summer, I hope! Anyone have a place for a fellow Mike Oldfield fan to stay in Barcelona, Madrid, and Ibiza? PS would someone please find me a poster (very big preferably) for TB2003? I would greatly appreciate any help in acquire such an item and will pay a 'reasonable' price. Why in Spain? Because, unfortunately, this is only the place where public still play him some attention, where WEA was interested in signing a recording contract with him, where media covered exahustively the launching of Tres Lunas, ( all kinds of opinions, of course), where you can listen to his music promoted on the radio, where you can purchase his new singles easily...Don´t misunderstand me because I´m Spanish, on the contrary, I keep on thinking that it was a mistake to sign with a filial ( Spanish or whatever), I knew this is a way only to get less audience, I will always prefer a more international Oldfield so all I´ve said above it´s said in anger. Of course, we must applaud the Spanish audience, no need to mention. What I would like to know is what the reasons for that are: anybody knows? Sorry, I wanted to write "pay him attention", not play. Greetings from Spain. Welcome again Mike. What about the concerts, there are no news and I think it´s time we should know something. Mmmm...I don´t like the look of this. ¿Por qué hablamos en inglés si casi todos somos españoles? Hello everyone!!! Best regards from Spain!!! The time has...come?????? Where is the promotion, the radio, tv???????????????? The fact is,this is an international forum....and english is the language most people know(even if it´s just a little bit),so you can communicate that well. popular be thy name again. Tubular Bells 2003's release date come. in the rest of the world as you do in Spain. Give us next time a completely new album. as we forgave you the bass sound. but do a world tour. And..... What about the tour in Europe????? The comment of Mariano is only a joke. Possibly you don't understand it but it's our humor. We will always speak in English, don't worry. Hi!! I am a spanish boy who lives in Madrid. Today i have gone to Warner Music Spain. They´ve told to me that they haven´t yet confirmed, but the next week i will can to speak with the Local Artist Boss there, and then i will know when and where will Oldfield be. But they confirmed me that Oldfield will be in Spain at the end of May. Sorry for my English!! Bye!!! And now, the question is: What about the premier concert? I went to my local record shop (Sam Goody) today and asked if they had a release date for Tubular Bells 2003 on their list of releases... well BIG SURPRISE... NOT!... TB2003 was not listed anywhere and they have all the new releases through the end of the summer. So if WEA is ACTUALLY releasing this "worldwide" on May 27th... how come no shop in America including Amazon.com have a clue about it??? Is America just dreaming WEA said this??? They'd probably give you some kind of twisted definition if you were to ask them what they mean by worldwide (perhaps the answer is something like "Sure, we're releasing it worldwide...we won't ship any copies outside Europe, but it'll be released everywhere...").